The reason for this NitePR/MKULTRA mod is because I wanted a way to test PSPAR codes on CFW, for me it was easier just to implement the PSPAR code types into an existing cheat device rather then try and patch the PSPAR EBOOT to run on CFW so that is exactly what I have done. Unlike the official PSPAR cheat device a more simple code file format is utilized for loading codes, the format is much like the CWCheat cheat database format but instead of code lines being preceeded with "_L " they are preceeded with "_M ". I also got bored and decided to implement the CWCheat code types so hopefully most CWCheat codes should work with this cheat device. TempAR 1.62-3 is considered the stable version. [+] User can now change the maximum number of cheats/code lines which can be loaded. [+] Added support for loading codes from PSPAR .bin files (checksum not validated). [+] Added support for loading codes from NitePR .txt files (converted to PSPAR on load). [+] Added 0xC1 code type (call function with arguments) to PSPAR extended engine. 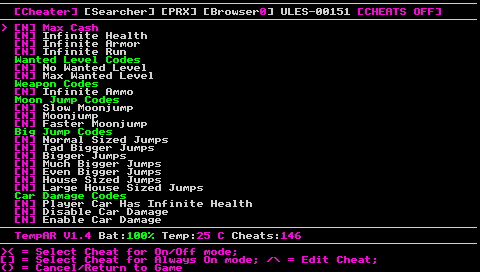 [+] Added 0xC2 code type (run code from cheat list) to PSPAR extended engine. code type could interfere with auto-off feature. [+] Added 0xC5 code type (counter) to PSPAR extended engine. [+] Added support for PSX GameShark codes. useful for shells such as Xplora, Prometheus ISO Launcher, etc. [+] Added option to swap functionality of CROSS and CIRCLE buttons in the TempAR menu. [+] Added multi-lingual support for the interface. [+] Added Japanese translation (thanks to HARO). [+] Added support for folders in folders using 0xCF code type. [-] Removed thread list and module list from lite version to reduce size. [-] Removed copy to text file from Disassembler. 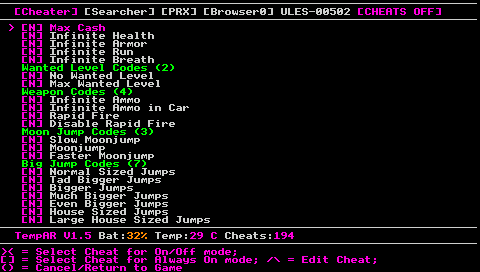 [-] Removed old PC tools since the functionality they offered is now integrated into TempAR. [?] Temporary data buffers are only allocated when needed to reduce memory usage. [?] Rewrote cheat.db file parser to make it ~1/3 faster. auto-off functionality will be enabled by default). [?] Pressing LTRIGGER in cheat menu now toggles cheat engine between active/deactive. RAM for custom framebuffer in PSX games.